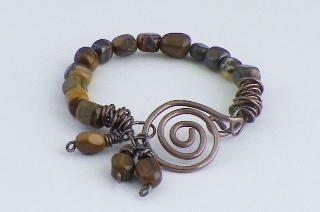 This bracelet is handmade by stringing 10mm zebra jade nuggets onto 18 gauge copper wire. Then ends were finished off with my favor messy wire wrapped loops. 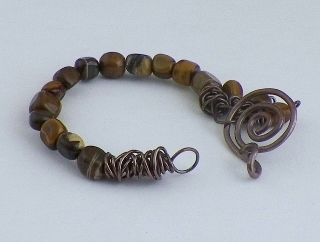 The clasp is handmade from 12 gauge copper wire that I formed into a spiral, hammered for added strength. Three jade gemstones dangle off one side of the clasp. Oxidized and tumbled to work harden and polish to a beautiful shine. Healing properties of jade: promotes prosperity, harmony, emotional healer.